Introduction: Gold is the most efficient metalic reflective coating over the entire IR range. And a protective layer of SiO can be used to protect the gold coatings and to make the mirror easy to clean.Bare gold coated mirror has higher reflection, but easier to get scratched. Introduction: Silver coated mirrors(Silver coated on quartz glass, BK7 glass substrates) offer the highest reflectance in the visible to IR spectral range over all the metal coated mirrors. In order to protect from oxidation these silver mirrors have an overcoat of SiO. With the exception of the UV, silver is an ideal choice for high reflectivity from 500nm to 2.0um. Introduction: First Surface Mirror/Front Surface Mirror with protected aluminum coating is the best choice for general broadband use. And SiO coating is used to protect the delicate aluminum coating, making it suitable for laboratory and industrial use. The protected aluminum coating gives a reflectivity that most closely matches the reflection of a bare aluminum coating. Introduction: PHOTONIK's UV-enhanced(UVE) coating is made by using an overcoat of MgF2 on Aluminum coating, which allows >85% reflection from 250 to 600 nm. 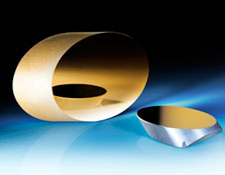 UV Enhanced Aluminum Mirrors are good for UV, Visible, IR reflection applications. 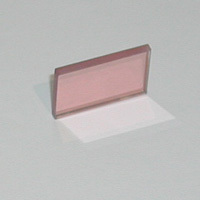 Introduction: PHOTONIK's Copper Mirrors are used for material analyse and processing. Introduction: Elliptical or Circular Flat Mirrors are ideal for research and astronomical applications. Because of their elongated major axis, they are suited to bending and folding light at precise angles with minimum wave distortion. Multiple sizes and coating options are offered to best suit a wide range of applications. Center holes thru drilled vertically or 45-deg angled are available from stock.Tapered holes can be specially processed. Custom process accepted.